I was introduced to fly fishing by my grandfather at the age of twelve. We spent the first week or two of summer vacations camping and fishing along the Deschutes River in Central Oregon. 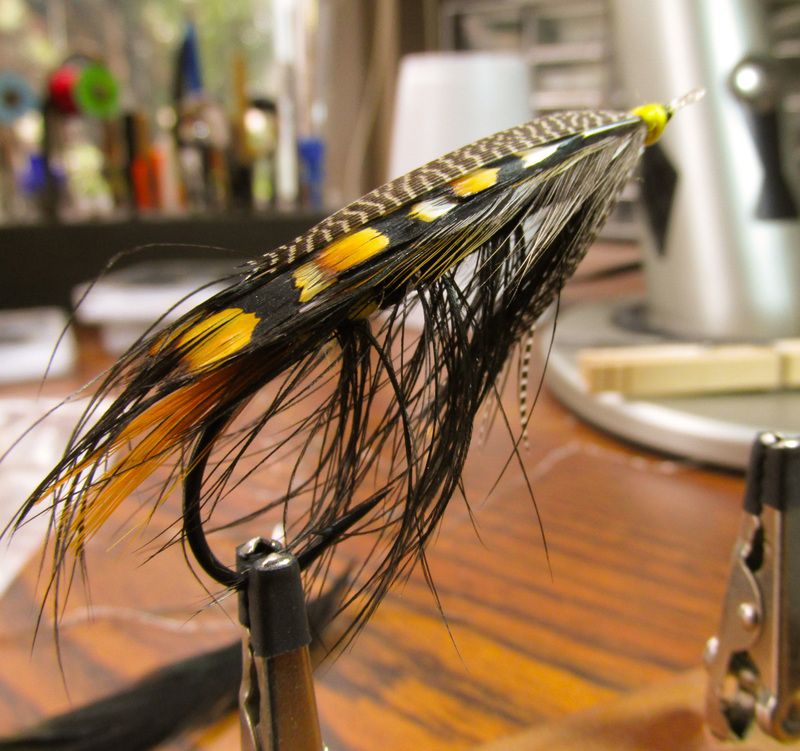 I dabbled in fly tying a bit through my late teens, but never really got serious about it until the early 1990’s. My how things have changed! I’ve tied and tried so many types of flies – you know how that goes. Anything “new” or re-discovered that comes along…I must tie it. A new material? I feel the need to use it. The latest bizarre pattern that caught the only hard-earned fish on a given trip…of course it is copied, placed into the fly box, and readied for future use. It’s a bit of an addiction, perhaps. Fly Tyer’s Anonymous would have huge membership, no doubt! Though I now tend to specialize in classic Atlantic Salmon patterns, that may seem to sell the allure of fly tying short. The mood to tie other styles often strikes, from go-to trout patterns, bluegill bugs for my kids and me to put to use, or a batch of steelhead flies for the next outing. I’m enthused by all of it, bored by none of it. It’s all good. I have always worked at tying a wide range of flies. It’s ever challenging, and it keeps my mind fresh and engaged. I love tying both classic and modern Speys and Dees, featherwing streamers in the mold of Carrie Stevens, steelhead flies old and new, tube flies, Waddingtons, classic winged wets, old country soft hackles, and any and all of the latest and greatest patterns to fill my fly boxes. As a proud member of the Daiichi Hooks Pro Staff, I am very happy to recommend their quality products. Bill Chase is a great guy who takes care of us tyers as we all work together to spread the word about Daiichi. They carry a large line of hooks in many different styles. If you have not tried any of their excellent quality hooks, I highly recommend you give them a try. I’m sure there is a model or ten that would be useful to your tying. I love passing along what has been shared with me or what I have learned. Known as a bit of the ‘professor-type,’ I have taught a number of classes over the years, demonstrated at shows great and small, contributed flies to various websites, been fortunate to have some flies published in books, and generally work to better my skills and understanding of our great craft/vocation/passion constantly. But I’m just a fly tyer. And I’d like to share some resources, thoughts, and ideas here. I hope this blog will serve as fodder for creative fly tying minds out there, and perhaps a resource for budding enthusiasts. TRADING FLIES – Anybody interested in trading flies? Want to share a unique pattern or two? A streamer? A favorite trout, steelhead or salmon fly? I enjoy seeing flies from all over the country (and world), particularly local favorites that may not get the pub of the ‘latest and greatest’ patterns hyped by the fly fishing press. Of course, I also like to see the latest and greatest patterns hyped by the fly fishing press! I’ve had wonderful exchanges with tyers over the years, from some really sweet flatwing streamers from Rhode Island, a beautiful Balmoral Dee, countless trout and steelhead fishing flies to a full-dress Jock Scott tied on a big stainless circle hook! Streamers, emergers, wet flies, tubes, dries, Waddingtons, doubles, etc……you name it. I love them all. Nothing better than getting a “present” in the mail and enjoying other tyers’ handiwork. Fly tyers are a great bunch of people, willing to share with one another techniques, materials, patterns, and everything that fires us up about this hobby. So if you’re interested at all in a trading a fly or two, drop me an email at nwflytyer@gmail.com.